Hello once more from the Scotia, where our survey has drawn to a close. We have now begun our journey back to Aberdeen, on Scotland’s East coast, from Geikie Slide and the Hebridean Slope Nature Conservation Marine Protected Area, which is situated seaward of the Outer Hebrides to the west of Scotland. We have had a great few weeks out here and have collected a lot of really useful information about this Marine Protected Area. Thanks to the persistent hard work of the crew and scientists aboard, and our continuing good luck with weather, we will have a comprehensive dataset describing the animals we have found (some of which have been mentioned and shown in previous blogs), and the seabed habitats which support them. This dataset will be used to help monitor change within this Marine Protected Area into the future. 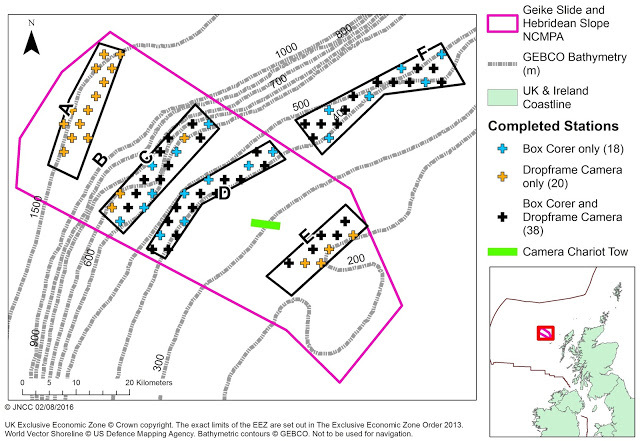 We have collected data from 5 different survey areas (Boxes A, C, D, E and F as shown in the map). The black crosses indicate survey “stations” where we collected both box core samples and drop-frame camera transects, the blue crosses where we collected box core samples only, and the gold crosses show where we collected drop-frame camera transects only. In total, we have collected 56 box core samples and completed 58 dropframe camera transects, as well as one camera chariot transect (green line). We have also encountered fish, whales, dolphins and seabirds such as gannets, skuas, kittiwakes and puffins, and a seal; a sign of the productivity, and hence importance, of this site. It is with many thanks to the captain and crew of the MRV Scotia and our Marine Scotland Science colleagues for all their efforts on this survey that we say farewell for now. Please check back with us next time for more seabed survey action! Left to right: Marine Scotland Science Scientist in Charge Eric Armstrong and (mostly) JNCC survey scientists Hannah Carr, Ellen Last, Bethany Graves, Kent Tebbutt (Benthic Solutions Ltd), Pete Chaniotis and Joey O’Connor (in front).